It’s as though a plume of smoke from the legendary train’s engine had set roots down on his upper lip. 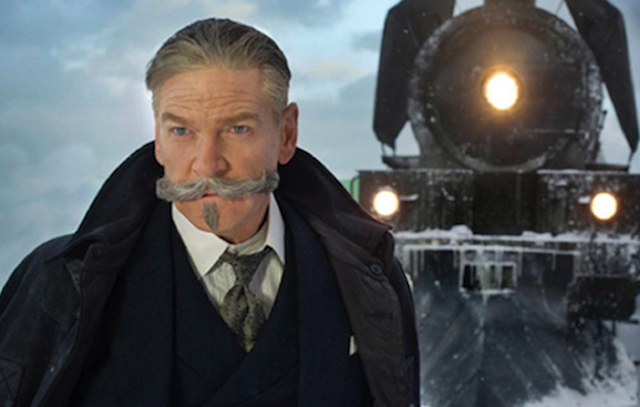 The mustache and the train are the best things about this star-studded-but-inert retelling of the famous mystery from author Agatha Christie. Director Branagh took cues from the 1974 film version, as he stocks the train with recognizable stars… including Penelope Cruz as a spanish missionary, Willem Dafoe as a racist Austrian scientist, Judi Dench wearing a permanent scowl as an aging russian princess, Johnny Depp as an art dealer with questionable business practices – along with his valet (Derek Jacobi) and personal secretary (Josh Gad) – and Michelle Pfeiffer turns up as a rich socialite who is seemingly out husband hunting. Eventually one of them turns up dead, and the train becomes stranded on the tracks by an avalanche. Master detective Hercule Poirot agrees to take the case. After a superfluous and unnecessary prologue in Jerusalem, the film starts off promisingly enough as Poirot enters the train hoping for a little R and R. Branagh’s best sequence in the whole film involves Poirot encountering, as he makes his way to his compartment and the train prepares to embark on its journey, a whole drawing room comedy full of characters. This is one of the most famous mysteries in history so the pleasures aren’t in the mystery itself, but seeing the wonderfully written story told well… and Branagh and company only hint at the old-fashioned-but-fun game of “Clue” ahead of them. Instead, he and screenwriter Michael Green spend too much time mucking about within a perfectly good plot. Why they thought Poirot needed a long lost love I’ll never know, and we didn’t need to see Branagh delivering monologues to a broken photograph. Invented preludes, and half assed lost loves only serves to waste time for both the detective and the audience. Poirot is another in the long line of brilliant-but-distant detectives like Sherlock Holmes, so Christie wisely gave him all sorts of sidekicks – in the doctor Watson mold – to help humanize this character device of plot resolution. 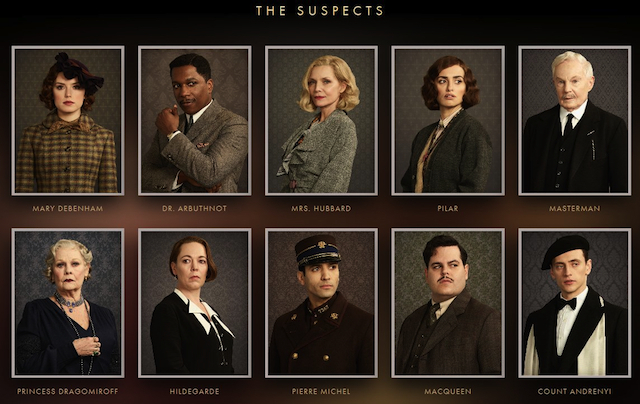 Poirot’s sidekick on the train is a layabout son (Tom Bateman) of a transportation mogul. He’s introduced picking up a prostitute for a quickie, and is not exactly the kind of character who can serve as an audience surrogate. He also never manages to make much of an impression. Branagh makes full use of the digital trickery available to him, maybe a bit too much. He sends his camera soaring over mountains and flying from high to low angles for seemingly no purpose. He seems to be laboring under the misapprehension that these are new and haven’t been done a thousand times before… thus blunting their impact. Branagh also seems fascinated by shooting scenes at odd angles, such as when he stages an entire scene with a body from above so we are treated to an extended view of the top of the actors heads. But Branagh’s performance is undoubtedly the highlight of the film – and he and that marvelous mustache are worthy successors to the role. Michelle Pfeiffer and Willem Dafoe seem to be having a ball as well. But the film overall lunges to its conclusion, and the resolution is botched so badly that it deflated the whole enterprise. Yes, it ends in a whimper, not a bang.